Besides being close to St. Pete, Clearwater beaches and Busch Gardens, Tampa also has one of the most fun night spot/entertainment districts in Florida -- Ybor City is alive each night with delicious Cuban restaurants, cigar bars, and some cool spots to savor some tasty beers. 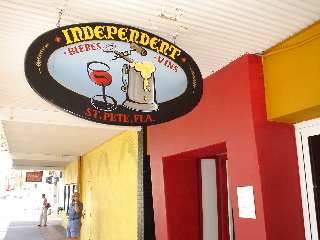 Outside of Ybor City there are also some fine spots to drink great beer. 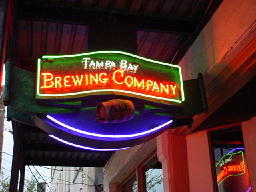 Look below for photos and information on all the places in Tampa that the beer aficionado should not miss. Info. on all FL Breweries! What a marvelous brewpub! If you love rich beers that are true to style, make your way to Tampa Bay Brewing Company as soon as you arrive in Tampa. There were nine house beers on tap when I visited in July, 2003. Making up the list were: Redeye Ale (an American Amber Ale), Jack the Quaffer Porter (Brown Porter), Old Elephant Foot IPA (on draft and cask), Iron Rat Stout (excellent Dry Stout), Wild Warthog Weizen (lots of spicy clove and banana flavors - delicious), True Blonde Ale (Kolsch with flavorful hops), One Night Stand Pale Ale, and a seasonal Trippel (9% alcohol with a very spicy, complex flavor)! Microbrews, English and German ales, and Belgian beers (including Chimay and Lindeman's Framboise) are also available on the guest taps. Wings, blue crab cakes, salads, burgers, sandwiches, pizzas, calzones, tabasco stout-n-honey glazed salmon, steaks, paella, and pastas round out the excellent food menu. 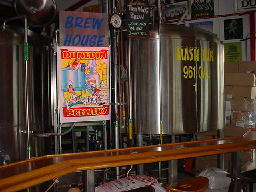 In mid-2006 Tampa Bay Brewing was in the process of moving the brewpub to a new location about one block away under the cinema complex in the Ybor Centro shopping area. The move will provide more space, sidewalk tables, and a 2000 square foot new kitchen. The German owners of the space in Ybor Centro worked very hard to secure the move, and plans are underway for an Oktoberfest-type celebration in the near future. All the old brewing equipment will be transferred to the new facility. 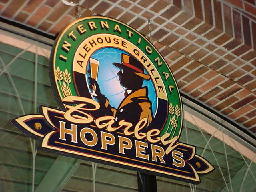 Located upstairs (above Starbucks) in the Centro Ybor shopping area, Barley Hoppers is a beautiful beer bar with an exceptional selection of ales and lagers from around the world. Your mouth will water as you look over the menu of over 168 beers (48 on draft) and outstanding pub fare. This bar opened its doors in 2000 and features "Beer Expedition" samplers that allow customers to order groups of 1/4 pints for easy tasting (4 samples run $5.50). Many high-gravity Belgian, English and German beers are available. The picture to the right shows Barley Hoppers associate and bartender, Wayne Tagle. 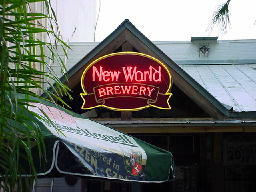 Unfortunately, this former brewpub is no longer brewing, but New World is still a fun place to hang out and sample an exciting selection of draft and bottled beers in the bar and out on the front patio. If you love Belgian-style ales, you'll be pleased to discover that the owners of New World have stocked some amazing examples including Saison Dupont, Rochefort 8, De Koninck, Delirium Tremens, Duvel, La Chouffe, Rodenbach, Caracole, Ommegang, and most of the Chimay and Unibroue products. There are 18 drafts (with an American microbrew emphasis) and 80 bottled beers (all served in the appropriate glass), video games, and music four nights a week. They open around 3 PM each day. The Irish Pub on 7th Avenue now has a German owner and has been renamed the Doppeldecker. 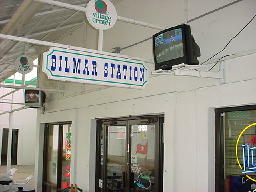 There are really two bars here -- a traditional bar just the main entrance and a tropical beer garden out back. DJs and live music are now frequent, but there were still three selections of Fullers ales on draft when I visited in April of 2006! They are open daily 4 PM to 3 AM, and happy hour runs M-F 4-8 PM. 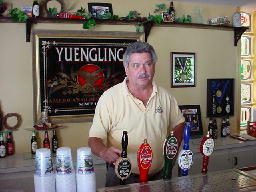 Be sure to do the Yuengling brewery tour to experience a bit of brewing history in Tampa. 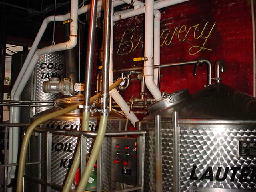 The brewery was built in 1958 by Schlitz and was bought by Yuengling in 1999. Tours are at 10 PM and 1 PM Monday through Friday and allow attendees to walk through the brewing and bottling facility and taste the fine beers in the hospitality tasting room. 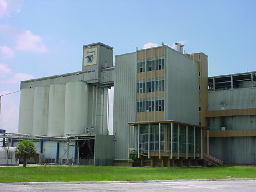 The brewery is located out near Busch Gardens just up from the intersection of Busch Blvd. and N. 30th. Yuengling's Tampa location is working hard to upgrade the old brewery into a fine facility that produces Premium Light Beer, Traditional Lager, Porter (nice toffee and caramel aroma and flavor), and Black and Tan (a blend of 40% Lager and 60% Porter). 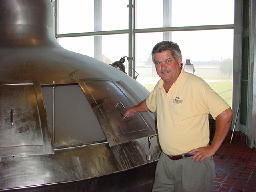 The photo to the top right is of John Houseman (brewmaster at Yuengling) in front of one of his wort boiling vessels -- John is very knowledgeable and enthusiastic about the line of Yuengling products. 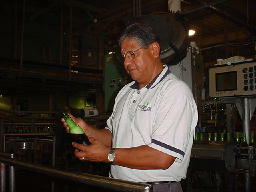 The bottom photos are of Ed Ybarra (production manager) and his bottling line. Yuengling is to be commended for restoring and preserving this fine old brewery. 13150 North Dale Mabry Hwy. Located near the back of a strip mall off Dale Mabry, Bilmar Station (formerly Hubb's Pub) has tasty pub grub, sports TV's, video trivia, and a very nice selection of 40 draft beers (good German and English selections) and some of the best bottled beers available in the area. Food includes burgers, chili, wings and sandwiches. 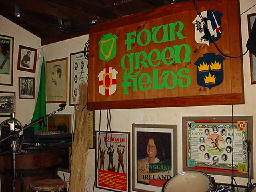 The name "Four Green Fields" refers to the four districts of Ireland. This place is one of the most authentic, attractive and friendly American Irish pubs on the map. 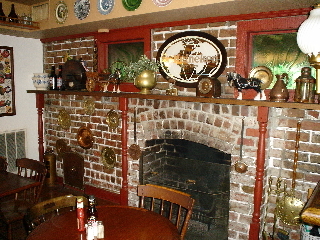 There is a real thatched roof, fresh Guinness, front patio, great Celtic music and hearty pub food. Four Green Fields is near downtown Tampa and is the ideal choice for a late night tune, pint, and snack. 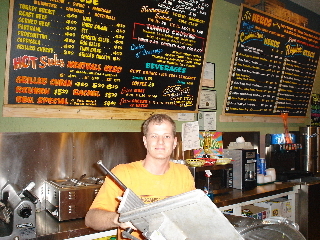 This sandwich shop/bar is located in a small strip mall a few miles outside of downtown Tampa. They open at 10 AM daily and feature around 25 choices of outstanding hero sandwiches including ham, salami, proscuittini, roast beef, cheese, pastrami, turkey, bologna, corned beef, and egg and tuna salad. Happy hour is M-F 3-7 PM and provides reduced draft beer prices. The bar is in the back of the sandwich shop and features selections from Allagash, Youngs, Sierra Nevada, Samuel Smith and Dogfish Head. The bottled selection is a bit more impressive than the taps. All draft beers are available in liter mugs! Located near downtown/Ybor City on a small island, this cute neighborhood pub has a red UK phone booth outside and a good selection of beers inside. 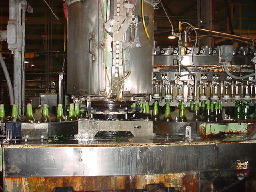 There are over 100 bottled beers from Dogfish Head, Avery, Dunedin, Shipyard and many imported brands as well. Tap standouts include Seadog, Delerium Tremens, Dogfish 60 Minute IPA, Chimay and Shipyard brands. Javier's kitchen in the back of the bar cranks out filling UK-style foods that include burgers, sandwiches, fish and chips and salads. 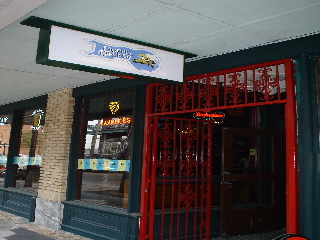 The pub opened in 1992. This small beer bar in St. Pete has quickly become known as THE place to find the most rare and unique brews in the Tampa Bay area. It is a spartan pub with a European feel about it. There are a dozen drafts the likes of Einbecker Schwartz Bier, Reissdorf Kolsch, Delerium Tremens, Chimay Triple, Weihenstephan, Hobgoblin, Val-Dieu, Affligem Blonde and Rogue Chocolate Stout. Hard-to-find European lagers are also available. Opening time is late afternoon. Limey's is like a cross between an English pub and a beach bar. 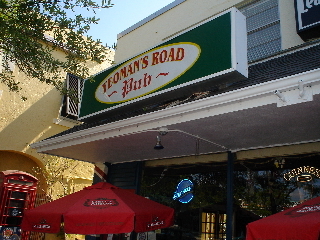 The photo was taken inside the main pub room, but there is a open air patio outside the bar that is very Floridian. The pub is only a few blocks from the center of downtown St. Pete and has 14 draft beers with Fullers ESB, Strongbow Cider, Tucher Hefeweizen, Guinness and Tetley's being the most flavorful choices. The diverse food menu features Scotch eggs, pub fries with gravy, bacon cheese fries, shrimp cocktail, onion rings, chili, fish and chips, shepherd's pie, beef and Guinness pie, bangers and mash, burgers, sandwiches, pork chops, crab cakes and stuffed broiled cod. 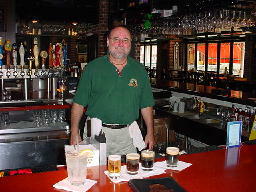 World of Beer, 2809 Gulf to Bay Blvd., Clearwater, FL, ph: 727-797-6905. This retail beer store stocks over 650 brands that are rotated often for freshness. El Sol Cigars, 1728 East 7th Ave., Ybor City/Tampa, ph: 813-248-5905. No beer here, but El Sol makes some of the best hand-rolled local cigars in Tampa. Fortunatos After Dark, 263 Central Ave. North.,St. Petersburg, ph: 727-898-4882. Opens in late evenings W-Sat for live music. 120 beers in all - some gourmet offerings. Around the corner from The Independent. Grand Cru, 11724 Dale Mabry Hwy. North, Tampa, ph: 813-269-8463. This beer and wine retail store has the added bonus of a tasting area. 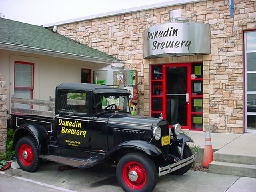 Purchase your bottle of Belgian ale and enjoy it on premises. ABC Package, 2001 N. Dale Mabry Hwy., Tampa, ph: 813-875-6214. Many of the ABC stores have good selections of gourmet beer. They have good prices on Chimay and McEwan's Scotch Ale.